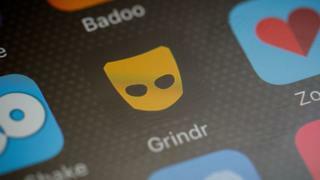 Two 17-year-old boys have been charged with robbery after three men who had arranged dates using the Grindr app were attacked. The victims were targeted in separate attacks on parkland in Bordesley Green, Birmingham, in January and March. Two attacks happened off Yardley Green Road on 5 January and 18 March, with a third off Hob Moor Road on 24 March. One of the charged boys appeared before city magistrates on Saturday and the other is due to appear on Monday. West Midlands Police said three other teenagers, aged between 16 and 18, who were arrested on suspicion of robbery had been bailed "with strict conditions".